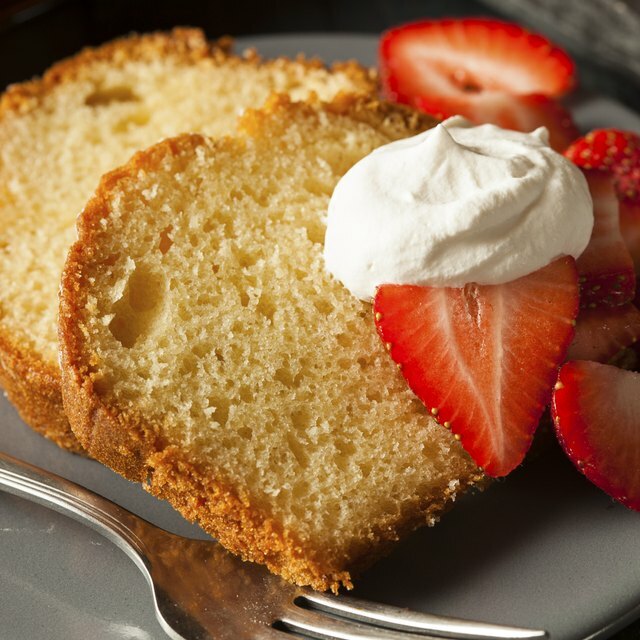 Serve strawberry pound cake with fresh strawberries and cream. 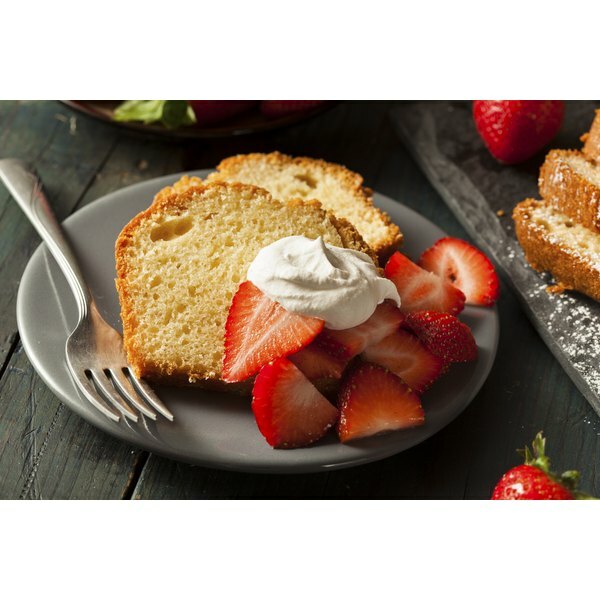 Strawberries add a fruity freshness to complement the density and richness of classic pound cake. The flavor can come from real strawberries, strawberry glaze or even strawberry extract. Fresh berries have the best flavor, but frozen berries work well when fresh berries are out of season. Start with your favorite pound cake recipe, such as the classic that uses a pound of butter, a pound of sugar and pound of flavor, or a recipe that includes cream cheese for added richness. Strawberry flavor extract mixed completely into the batter ensures strawberry flavor in each bite of pound cake. For a standard pound cake in a bundt pan or loaf pan, use 2 to 3 teaspoons of strawberry extract to suit your taste. Strawberry extract doesn't have much effect on color -- some are clear -- so add food coloring to give the cake a pink tint. A swirl technique makes the interior look more attractive and adds extra flavor bursts throughout the cake. Divide one-third of the batter into a separate bowl. Add extra strawberry extract and tint it a deeper shade of pink. Pour the lighter-tinted two-thirds of batter in the cake pan. Drizzle the darker batter on top and gently swirl it into the lighter shade with a toothpick or knife. Real strawberry fruit folded in pound cake batter delivers a chewy, authentic texture within the cake not achieved with flavoring alone. Add the strawberries to plain pound cake batter if you prefer to keep some of the classic flavor or fold them into a strawberry-flavored batter. Sprinkle sugar over fresh strawberries and let stand for about 30 minutes to macerate them, adding extra sweetness while drawing out some moisture. Excess moisture can affect the batter consistency, so strain the juice before adding to the batter. Frozen berries should be thawed to allow excess juices to drain. Strawberries should be sliced or chopped so they distribute more evenly throughout the cake. The amount of strawberries depends greatly on preference, but 2 cups results in a fairly well-balanced fruit distribution without overwhelming the cake. Pound cake with strawberry swirls burst with flavor, while the bright red color contrasts against the golden cake. One of the easiest ways to make strawberry swirls is with strawberry jam or strawberry sauce. The jam may need to be warmed or diluted with warm water to a drizzling consistency. Pour plain pound cake batter into the cake pan. Drizzle the jam or sauce over the batter in a zigzag pattern. Drag a toothpick or knife through the batter in a wavy pattern to create red swirls within the batter. For even greater swirl variation, add half the batter and swirl in the strawberry before finishing with the remaining batter and more strawberry swirl. If you have an abundance of fresh or frozen strawberries, simmer them with sugar and water to create a thick sauce to use for the cake. Strawberry pound cake does not require a topping, but toppings help add extra flavor and boost cake presentation. A strawberry glaze topping enhances the cake's sweetness while adding a bit of extra moisture to this notoriously dense cake. The most basic glaze requires only powder sugar and milk to thin it to a drizzling consistency. Replace part of the milk with warm, runny strawberry jam or strawberry sauce to make a strawberry glaze. Alternatively, use the full amount of milk with strawberry extract added for flavor. Tint the glaze pink with red food coloring. If you prefer flavor from real strawberries, make a sauce with sugar, water and the berries in a saucepan. Drizzle the sauce over a whole cake or over individual slices. If you need a simple option for individual servings, top a piece of pound cake with sliced strawberries and whipped cream.